Chess is a classic two person board game. It is played with specially designed pieces on a square board made up of 64 alternating light and dark squares arranged in eight rows and columns. First appearing around A.D. 600, the game steadily evolved into the modern game known today. The earliest methods of production involved carving the board and pieces out of wood or stone. Today, a variety of common modern manufacturing methods such as injection molding and lithographic printing are employed to mass produce thousands of games. The objective of the modern chess game is to force the opponent's most important piece, the king, into checkmate. This is a position in which the king cannot be moved to avoid capture. The player with the white pieces begins the game by moving a piece to another square following the rules that govern piece movement. The players alternate moves until one player is either checkmated, resigns, or there is a draw. Thousands of books have been published relating to the strategies during the three key stages of chess, including the opening, the middle game, and the end game. While the exact time and place of chess's origin is debated, most scholars believe it was developed sometime around the sixth century A.D. It is a descendant of a game called chaturanga, which was commonly played in India during that time. (Chaturanga is derived from a much older Chinese game.) The name chaturanga is a Sanskrit word that refers to the four divisions of the Indian army, including elephants, chariots, cavalry, and infantry. These pieces became the basis for the four types of pieces in the game. Two of the key similarities between chess and chaturanga is that different pieces have different powers and victory is based on what happens to the king. During subsequent years, chaturanga spread throughout the Middle East, Asia, and Europe. Chaturanga was introduced to China around A.D. 750 and then to Korea and Japan by the eleventh century. In each of these places, it took on different characteristics. For example, Chinese chess has nine files and 10 ranks. It also has a boundary between the fifth and sixth ranks, which makes it a slower game than the Western version. In Persia, the game was called shtranj and it was in this form that it was introduced to Western Europe when the Moors invaded Spain. By the tenth century, the game was commonly played throughout Europe and Russia.. Chess pieces and a chessboard set up. that also helped to make the game more widely accepted. The rules and piece design steadily evolved, reaching the current standard during the early nineteenth century. In the twentieth century, chess experienced a tremendous growth in interest resulting in the development of various chess organizations and the crowning of a world champion. The first computer chess program was introduced in 1960. Steady improvements in technologies and algorithms led to the 1996 defeat of the world champion, Garry Kasparov, by a computer called Deep Blue. Historically, the game's pieces have been both simple and highly decorated. Prior to A.D. 600, the pieces were plain. These were replaced by detailed sets depicting royalty, warriors, and animals. From the ninth to the twelfth centuries, Islamic rules prohibiting the depiction of living creatures resulted in basic pieces made from clay or stone. This change is actually thought to have increased interest in the game at the time because it made sets more widely available and was less distracting to the players. When the game spread to Europe and Russia, highly ornate sets were fashionable. The standard set for modern chess pieces was introduced by Nathaniel Cook in 1835. His set was patented in 1849 and endorsed by the leading player of the day, Howard Staunton. Staunton's promotion of the set as the standard led to it being known as the Staunton pattern. Today, only Staunton sets are allowed in official international competitions. A typical chess set has 32 pieces. These are broken down into two sets of 16 pieces each. In each set there are eight pawns, two rooks, two knights, two bishops, one queen, and one king. The different pieces are distinguished by their appearance. The designs vary from simple plastic shapes to intricate, hand-carved statues. While piece size varies depending on the specific set, the tallest piece is typically the king, followed closely in height by the queen. The shortest, least notable pieces are the pawns. The rook has varied considerably over the years, being represented as a ship, castle turret, or a warrior in a chariot. The chess board is square and made up of 64 alternating light and dark squares arranged in eight rows and columns. The vertical columns extending from one player to the other are known as files. The opposite rows are called ranks. An important aspect of large scale chess piece manufacture is the process of designing the mold. A mold is a cavity machined from steel. When liquid plastic or molten metal is injected into the mold, it takes on the inverse of the mold's shape when it cools. This results in a finished piece. The mold cavity is highly polished because any flaw can result in a flawed final piece. For making chess game pieces, a two part mold can be used. To make the piece, the two mold sections are joined together and injected with the base raw material. The mold is then opened and the piece drops out. Special release agents and a tapered design help make the parts easier to remove. When molds are designed they are made slightly larger to compensate for the fact that plastic shrinks while it cools. Chess sets have been made with a number of raw materials over the years. Materials as diverse as ivory, glass, wood, clay, pewter, stone, and various metals have been used. Today, the most widely available chess sets are made of plastic. Plastic is a mixture of high molecular weight polymers and various fillers. For a plastic to be suitable in chess-piece manufacture it must be easily colored and heat stable, and have good impact strength. The most often used plastics are thennoset plastics such as polymethyl methacrylate (PMMA). Polymers found in plastics are typically colorless, so colorants are added to make the chess pieces look more appealing. Colorants include soluble dyes or comminuted pigments. Titanium dioxide can be used for white colored pieces. For more ornamental sets, other inorganic materials such as iron oxides can be used to produce yellow, red, black, brown, and tan pieces. Various filler materials are added to the plastics to produce durable, high quality pieces. For manufacturing ease, plasticizers are often added to the plastic. Plasticizers are nonvolatile solvents that increase the flexibility of the polymer. To improve the overall properties of the plastic, reinforcement materials such as fiberglass may be added. Other additives include ultraviolet (UV) protectors, heat stabilizers, antioxidants, and manufacturing aids. The basic steps involved in the creation of a chess game include creating the mold for the pieces, producing the pieces, producing the board, and final assembly. The following manufacturing procedure represents a method that mass producers of the game might use. Some shops still make their sets by hand, a time consuming process that involves carving the pieces from the raw material. 1 In the earliest phase of manufacture, designs for the chess set pieces are drawn out on a board and used as a guide in making the molds. Pieces are then handmade, typically starting by making the general outline of the piece with a wire frame. Clay is then molded around the frame and shaped to look exactly like the desired piece. 2 When the clay model hardens, a plaster mold of it is produced. From this mold, a steel die (or mold) is then machined, which will allow the exact duplication of the clay model. In some cases, a set of steel molds are connected together so that the whole set of chess pieces can be made in a single injection molding step. 3 With the steel molds made, plastic pellets are transformed into chess game pieces using injection molding. In this process, pellets are put into a hopper connected to the injection molding machine. They are forced through a high-pressure screw and melted. The screw is turned, forcing the melted plastic through a nozzle and into the mold. Just before the plastic is injected, the two halves of the mold are brought together to form the shape of the chess piece. Inside the mold, the plastic is held under pressure for a set amount of time and then allowed to cool. As it cools, the plastic hardens, the mold is opened, and the chess game piece is ejected. The mold then closes again and the process begins again. 4 The construction of the board depends on the starting raw material. Wood and stone sets are cut or carved to specifications. For mass produced sets, the main raw material for the board is cardboard. The cardboard is first cut in a square to the exact dimensions desired, and then it is printed. The printing process involves a printing press fitted with plates. When the press is turned on, the plate passes under a roller and gets coated with water. An ink roller is passed over the plate and ink attaches to the plate in specific printable spots. 5 Ink is transferred from the plate to a rubber roller. The rubber roller is passed over the cardboard, which causes a transfer of ink. The cardboard is then passed to the next roller assembly where the next color is added by a similar process. The ink is specially formulated so that it dries before it enters the next roller assembly. This process of wetting, inking, and printing allows for continuous manufacture of printed chess boards. After all the printing is done, a special clear polymer coating may be applied to protect it and give it a glossy look. 6 To finish production of a game set, all the different components are brought to the packaging area. The exact package depends on the final design, however, in most cases the pieces are put into a box along with the board. During this stage, instruction sheets or other booklets are also put in the box. It is then taken by conveyor to a shrink-wrapping machine..
7 On the shrink-wrap machine, the box is loosely wrapped in a thin plastic film. It is then passed through a heating device that shrinks the film and wraps the box tightly. The boxes are then put into cases and stacked on pallets. They are transferred to trucks that deliver them to local sales outlets. The quality of the chess game parts are checked during each phase of manufacture. Line inspectors check the plastic parts to ensure they meet size, shape, and consistency specifications. The primary test method is typically visual inspection. When a damaged plastic part is found, it is set aside to be melted again and reformed into a new chess game piece. The future of chess sets is likely to involve the improvement of computerized chess sets. Currently, many manufacturers produce single person, computerized games that allow the player to compete against a computer. In the years to come, these computer chess games are likely to become more sophisticated, challenging even the best players in the world. In addition to the current game, variations have been developed. Future chess sets may involve multiple levels in which pieces will be able to attack not only forward and backward, but also up and down. New board shapes have already been introduced making it possible for up to four players to be involved in a game at once. The manufacture of chess pieces requires a high level of skill and precision. Mass produced plastic chess sets are injection moulded which lends itself well to producing 1000s of cheap, yet perfectly functional chess sets. 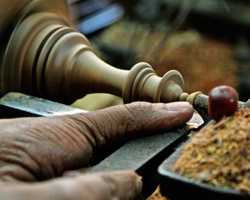 Wooden chess pieces however must be individually turned and carefully fashioned by hand. Chess pieces begin life as shapeless blocks of hardwood. It’s important that a high grade of solid hardwood is used, any voids or knots will render the chess piece a reject (or at least it should do). Typical woods for chess piece production include boxwood, ebony, rosewood, and sandalwood. Some very expensive chess sets contain extreme amounts of detail, the knights displaying strands of hair and detailed teeth. It is therefore essential to use a dense, consistent wood that is solid enough to be carved to this level of detail and remain strong enough during use. Amateur wood turners will sometimes attempt to turn their own chess pieces, often will ill fated and inconsistent results. The professional method of chess pieces turning involves a metal blade that is essentially a reverse blank of a chess piece. In fact the finished chess piece should fit into the pattern of the blank perfectly. This metal blade must be extremely sharp & hard. It must be able to cut through dense hardwood while avoiding splinters. 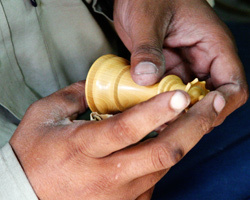 Using this method allows a skilled wood turner to create uniform chessmen at quite a pace. The resulting chess pieces are now perfectly formed and ready for polishing and weighting. In the days gone by most high quality chess pieces were weighted with lead. The chess piece was hollowed out and molten lead poured inside. The unsightly base area was then covered with a leather or felt pad. This resulted in extremely heavy chess pieces, just what most chess players desire. These days the use of lead in products, especially those that might come into contact with children is frowned upon, indeed many developed countries have banned the import of lead products. The result is that most modern chess men are weighted with short stubby pieces of steel or iron. High quality chess pieces usually have a smooth and shiny surface. An initial glance often leads people to believe that a form of lacquer is applied in order to achieve this finish. Indeed some chess pieces are lacquered, usually in colours such as red, white or black. The most traditional finish however is a natural wood finish that is polished to a high shine. The detail, fine lines and intricate carvings of some chess pieces would be subdued by the process of applying lacquer to achieve a uniform shine. Therefore the best method is wax polishing. This process involves a motorised polishing wheel that spins at high revs. The rough chess pieces are held up against the polishing wheel until the grain has been polished super smooth. A very hard wax is applied to the spinning polishing wheel, the heat from the friction melts tiny amount of the wax that become embedded in the fibres of the wheel. This wax then transfers itself to the surface of the chess piece and becomes part of the surface of the chess piece. In it’s pure form the wax seems as hard as glass, only when it gets hot does it soften enough to become part of the polishing process. The result of this process is a beautifully finished chess piece, shiny yet not too glossy and still full of detail and precision. The pawn is usually the smallest of the chessmen, in fact sets where the pawns are larger than the other chessmen are extremely rare. Certainly in all the Staunton chess sets the pawns are the smallest and thus reflect their power within the actual game of chess. The classic Staunton pawn follows a set design whereby a round ball sits upon a pedestal. Chess set manufacturers will aspire to creating pawns with near perfect round balls on the top, a flattened top, or highly non spherical pawn doesn't look good. Those with the roundest balls are best. The rook takes on the depiction of a castle turret. Due to its significance in the game of chess it's not unusual to see slightly disproportionately large rooks within a set, although by tradition they should be just one up from the pawns in terms of size. Despite it's simple round castle shape rooks can take on enormous detail shown in the precision of their angles and turning. A perfectly made rook is extremely satisfying, simplicity made perfect! It's often said that bishop wears a hat, in real life Bishops certainly do so why not in chess? The bishop would essentially be a fairly plain piece if it were not for the slot cut in the hat. The angled slot can range from a basic cut on cheap sets, through to a stunning bevelled carving on luxury sets. We are of course talking about Staunton bishops here. Chess playing aside, the knights are without doubt the most significant pieces in a chess set. People have bought whole chess sets simply because of the knights. Even the most ornate and obscure chess sets tend to depict a horses head for this piece, but the Staunton chessmen got it right. The original design has inspired thousands of variations of the Knight, often seen as the piece with the most scope for creativity and complexity of carving. On seriously expensive luxury chess sets it's not unusual to see knights with flowing hair, teeth and gums, pupils in their eyes and a very specific facial expression. What is more amazing is how this amazing artistic carving is duplicated four times for one set with each of the knights looking completely identical. The queen is usually the second tallest of the pieces and takes on a sleek elegant appearance. In most chess set designs she wears a crown. The Staunton design typifies this and keeps the piece feminine while retaining a sense of authority. Expect to see most expensive luxury sets of chessmen come with not two, but four queens in the set. Last but certainly not least is the king. The tallest of the chessmen and certainly the most majestic. Often seen by collectors and enthusiasts as the most beautiful of the pieces. A king has elegant curves and a distinctive shape, it's iconic profile is as legendary as a coca cola bottle. The top of the king is decorated with a cross like piece called a phinnial. Traditionally in the shape of cross this piece is usually carved separately from the rest of the piece and in the case of very luxury sets can be very intricately carved and polished. This is a blog from Team Planet Chess. If you want to join this team, click on the link above. A chess team on Gameknot. The Team started June 2013.